A picture of the baby born at Novant Health Friday night in the middle of Florence. Florence didn't stop two eastern North Carolina parents from welcoming a baby boy into the world. BOLIVIA, NC (WFMY) - A hurricane couldn't stop one North Carolina couple from bringing life into the world. 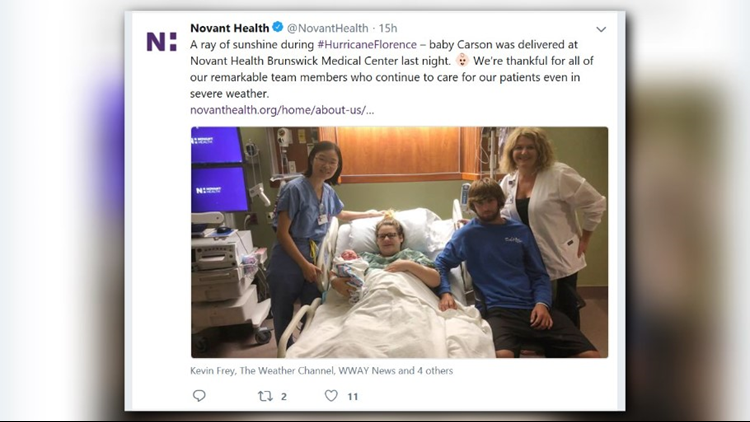 Two eastern North Carolina parents welcomed their first child despite the life-threatening weather Friday night in Brunswick County. Amber Simmons and Conner Faulk had a baby boy at Novant Health Brunswick Medical Center right in the middle of Florence. "We were pretty nervous," said Faulk in a release on Novant Health's website. "Everybody kept telling us it was going to happen during the storm." Carson was delivered via C-Section at 8:17 p.m.
Florence downgraded to a tropical storm Friday night after making landfall Friday morning near Wrightsville Beach, bringing mass flooding to the region.